The Engagement Ring represents a formal agreement to future marriage. An engagement ring is offered to your partner as an engagement gift either while you are proposing or directly after your future spouse accepts the marriage proposal. Also known as a wedding band, the wedding rings are exchanged between partners on their wedding day and indicates the wearer is married. 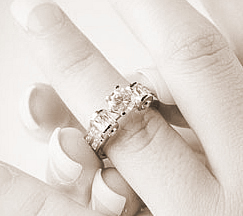 Discover more about the various types of men's and women's wedding rings and wedding bands. With various international standards for ring sizing it can be difficult to shop for a ring online without knowing your own ring size. At The Jewellery Shop, we give you the knowledge. View our beautiful collection of sterling silver jewellery, a great idea for bridal gifts. It is traditional for a lady to wear her wedding ring closest to her heart, and wear the engagement ring on the same finger, over the wedding ring. 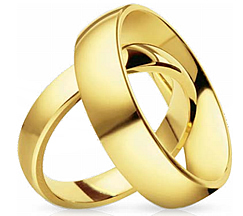 If you choose this tradition, consider how the rings will fit together.